Female cycling enthusiasts from across the region are gearing up to pedal a stage of the new Tour de Yorkshire cycle race. The group of women have set themselves the challenge of completing the second stage of the race, which is 108 miles, and starts at Selby Abbey before taking in much of The Wolds. It will pass through Bubwith, Harlthorpe, Foggathorpe, Holme-on-Spalding Moor, Market Weighton, Sancton and North Newbald and then on to Beverley. Stage two will also see cyclists travel through Stamford Bridge before finishing in York. The cyclists will take it in turns to complete a section of the stage, carrying a baton along the way. The event will take place on 14 March. All the women are Breeze Champions and organise fun bike rides in the region. Breeze is a national initiative run by British Cycling which tries to encourage more women to take up cycling. The Selby Breeze Champions will start the ride and cycle to Market Weighton. 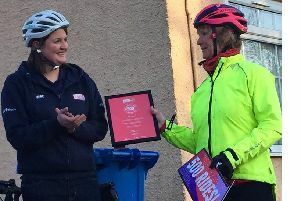 Val French, from Barmby Moor, and two other Breeze Champions, along with any other riders who wish to take part, will carry the baton from Market Weighton to Bainton. The Driffield Breeze Champions will cycle with the baton to Malton and pass it on to the York Breeze Champions, who will cycle with it to the finish. The inaugural Tour de Yorkshire will be held on 1, 2 and 3 May this year.